Located in the Pearl District at NW 12th and Everett, The Casey is designed to be one of the finest residential buildings in the city. It has only 61 units, most with two or more bedrooms. The building has achieved a LEED platinum rating making it one of the most environmentally friendly and sustainable buildings in the country. Amenities include art glass along the facade facing NW Everett Street, concierge, elegant finish work, secured parking and entries. Please contact us directly if you'd like information on Portland luxury condominiums. There are 6 listings found for The Casey. Spacious, elegant unit in the Casey, a LEED Platinum building. 24/7 concierge. Large rooms with open floor plan that has two separate en-suite bedrooms. Gourmet kitchen features high-end appliances and walk-in pantry. Large utility/laundry room. Two additional storage cages near deeded parking. Be in the heart of the Pearl District - a perfect walk score. A great community to live in or have as your pied-a-terre in the city. The Pearl District is at your doorstep when you call Casey #201 home. This NE corner unit has a flexible 2bed + den floorplan. Fine fixtures & finishes include teak hardwood floors, walls of windows & a marble fireplace. Kitchen features Sub-Zero, Miele, quartz counters & a wine cooler. Sumptuous master suite with limestone bath, double sinks & separate shower. Huge east facing terrace! Very well run HOA. Full time concierge. Open House Sunday April 28th 1-3pm! Ultimate in Condo Living in one of PTLD's Most Sought After Buildings! Stunning SE Facing Unit, Dramatic Wall of Windows lets light flood in with Treetop City Views, Great Room w/FP, Dining Rm with Door to Outside Balcony, Family Room and/or Office provides Flexibility. Generous Storage/ Utility Room plus 3 storage units (1 on the unit floor). 2 Deeded Parking Spaces Side by Side. Stunning Luxury Condo at The Casey. Expansive SE views of urban cityscape. Floor to ceiling windows fill unit w/natural light. Dual Master Suites provide privacy & relaxation. Gourmet kitchen boasts high end built-in appliances & wine fridge. Family rm/flex space for den/media room, multimedia wiring throughout. 2 side-by-side parking spaces & 98 sqft storage space! Sustainable living w/LEED Platinum Cert. 24-hour concierge. 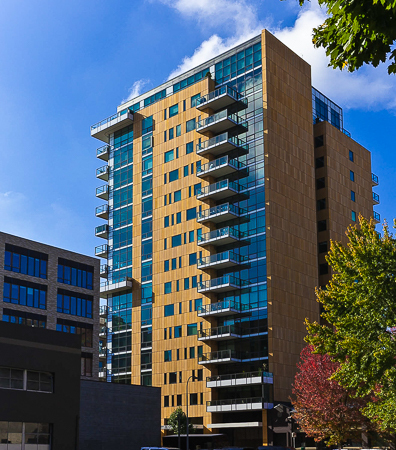 LEED Platinum sustainable living in the highly sought after Casey building. This 14th floor unit features a generous master suite w/bath & walk-in closet. Open living spaces w/floor to ceiling windows showcasing the incredible west & north city views. Motorized blinds for privacy/sun protection. Primo parking spots and rare oversized storage room. Custom kitchen and built-ins throughout. The very best in Portland urban living! Luxurious Condo in The Casey - the ultimate in refined urban living. With floor to ceiling windows, you can relish a bright & open living space blending seamlessly with a kitchen packed with luxurious extras. First LEED Certified Platinum building in U.S. Superb 2 bdrm + office/den & outdoor balcony w/ gas hook up. Elegant & simple, this condo stuns with views, attention to detail & high ceilings. - The content relating to real estate for sale on this web site comes in part from the IDX program of the RMLS(TM). Real estate listings held by brokerage firms other than City Properties are marked with the RMLS(TM) logo, and detailed information about these properties includes the names of the listing brokers. Listing data is copyright ©2019 RMLS(TM). This data last updated on 4/24/19 9:29AM. Some properties which appear for sale on this web site may subsequently have sold or may no longer be available. Equal Housing Opportunity. | Oregon Agency Disclosure | Legal Info | Site Map | Home | Contact Us | Site by HS1.com.